Welcome to the world Little Miss E.
In the wee morning hours of August 11th, this beautiful little thing made her grand appearance. She was a perfect 7 lbs 4 oz. 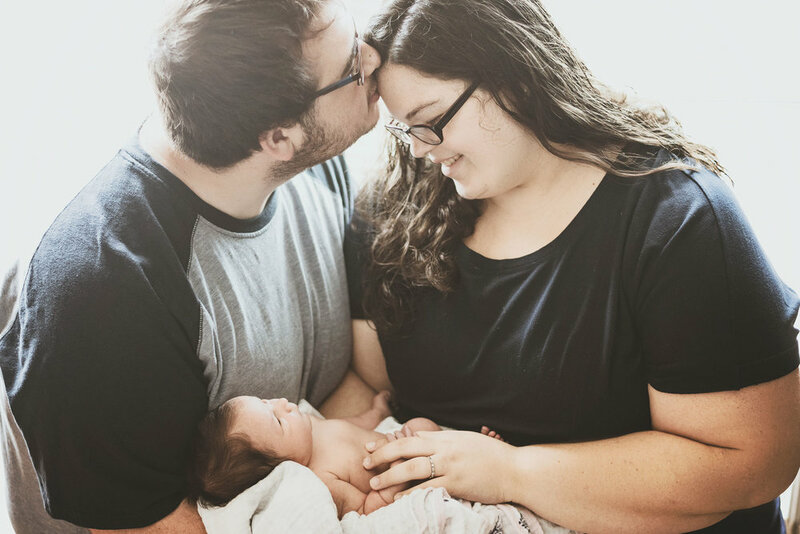 Shortly after birth she decided she needed a little extra help and spent a few days in the NICU, while mom needed a blood transfusion. She may have had a stressful start but she came home four days later healthy, happy and more loved than she will ever know. I enjoyed watching Mom parent 4 kids like a pro. Walking into their home felt like she was born to be a mom to 4. She took everything in stride, and even with the sleep deprivation that a newborn brings, looked well rested. Props to Dad for making sure she has the support she needs to make it look like that. 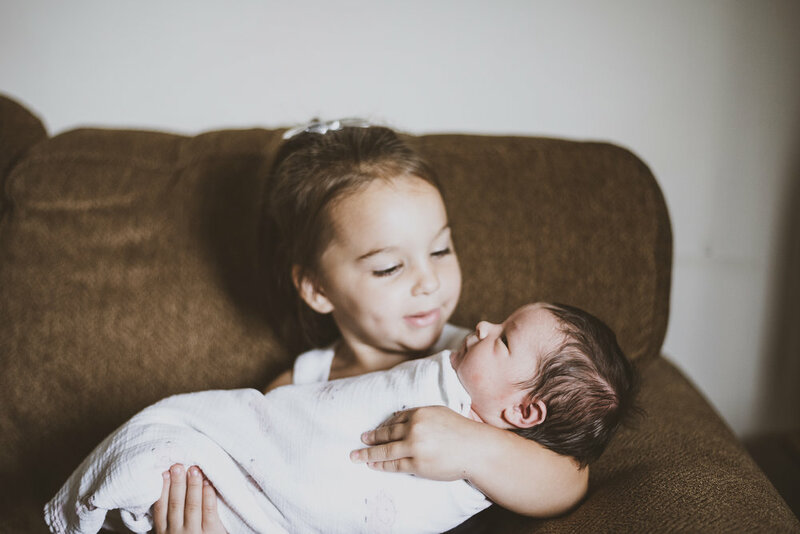 Whenever I enter into a home with a newborn and siblings, my first thing is to talk to the big brother(s)/sister(s) about how they feel about their new addition. Like I suspected after our spring session, big brother was overjoyed to be a brother for the 3rd time. I can tell by the way he talks about her and watches her, that he is going to be the protector. 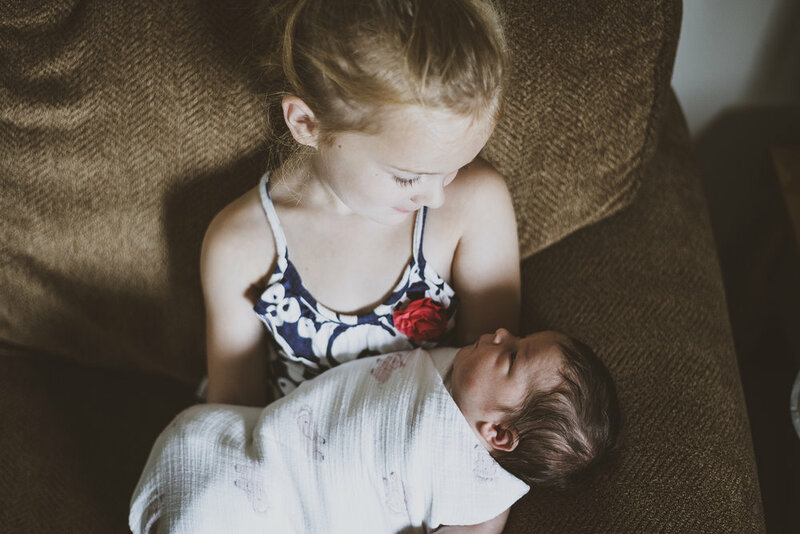 The newest big sister we enamored with her baby sisters tiny-ness. Staring at her toes and fingers, I could see she was trying to take in these features of her sister that are going to change and grow faster than anyone wants. My biggest surprise came when mom and dad told me that the middle sister (now promoted to oldest middle child), had refused to hold her sister. She seemed happy but more apathetic about the whole thing. After observing her mannerisms around her new sister, it hit me- she was scared to death of hurting her. Dad had a good talk with her about how babies are tiny and yes, we need to be gentle with them, but she won't break her. Being able to watch her open up and bond with her sister was amazing. I am thrilled I was able to be there to capture this for Mom and Dad. I hope this tiny little girl can look back on these photos and see how much she is loved. She is so lucky to be surrounded by so many people who only want the best for her, to see her grow and learn and make a difference in this world. I look forward to watching this family adjust to being a family of 6. Mom and Dad make it look easy, even while Mom is trying her best to recover and Dad is working hard to take care of everyone. You two keep doing what you are doing, because you are doing it right. The sleepless nights end too fast, (sometimes thankfully), and before you know it, Miss E will be walking, talking and torturing her siblings. Information on how to book your own newborn session can be found here. if you are looking for that perfect, unique baby shower present for that special momma-to-be (1st time or again), contact me and we can talk about gift options!